Frontline Combo, against infestations with fleas, ticks and/or biting lice, also for prevention of the multiplication of fleas by inhibiting the development of eggs, larvae and pupae originating from eggs laid by adult fleas. 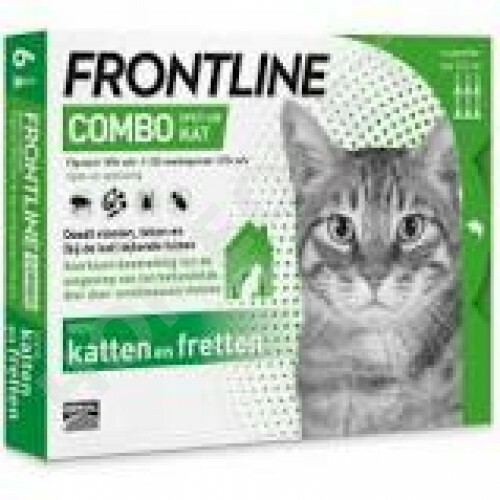 FRONTLINE® Combo for Cats contains; fipronil and the insect growth regulator (IGR) (S)-methoprene. FRONTLINE® Combo effectively targets all stages of fleas. Fipronil collects in the oils of the skin and hair follicles, and continues to be released from hair follicles onto the skin and coat, resulting in long-lasting activity against fleas, ticks and chewing lice. Frontline Combo helps to prevent the contamination of the environment of treated animals with flea infestation. Elimination of fleas (Ctenocephalides spp.) and insecticidal efficacy against new infestations with adult fleas persists for 4 weeks. Prevention of the multiplication of fleas by inhibiting the development of eggs (ovicidal activity), larvae and pupae (larvicidal activity) originating from eggs laid by adult fleas for 6 weeks after application. Elimination of ticks (Ixodes ricinus, Dermacentor variabilis, Rhipicephalus sanguineus). The product has a persistent acaricidal efficacy for up to 2 weeks against ticks. Frontline Combo Spot On can be used during pregnancy and lactation. Do not use on sick (systemic diseases, infections…) or convalescent animals. The product should not be used on kittens less than 8 weeks old and/or weighing less than 1 kg. In the absence of safety studies, the minimum treatment interval is 4 weeks. It is important to apply Frontline to an area where the animal cannot lick it off, and to make sure that animals do not lick each other after treatment. If licking does occur, a brief period of hypersalivation may be observed, due mainly to the nature of the carrier. Ensure that treated animals do not groom each other after treatment until dry. Frontline Combo for cats is availble in pack sizes of 3 or 6 pipettes. Place the tip of the spot-on pipette on the skin and squeeze gently to empty its contents onto the skin, preferably at two spots, one at the base of the skull and a second 2-3cm's further back.